I would like to buy the correct shift lever/console for a 5 speed Sears Spyder. This bike has the single top tube frame and 24 inch wheels. Hi, I am looking to purchase a 1969 CCM Mustang Cobra either in Gold or Blue and also a 1967 Gold CCM Duomatic. Both bikes should be in Fair to Mint condition if possible. I am just West of Toronto ,Ontario, Canada and prefer to pick it up. Thanks, John in Brampton. 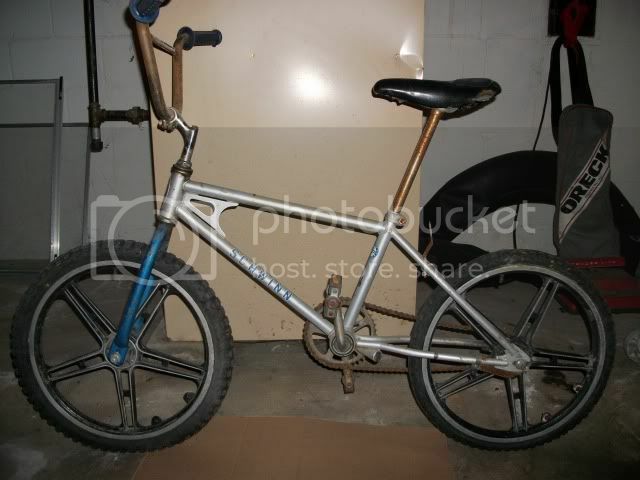 I have a bicycle that i think is from the 70's it is a chopper style bike. I know that it is not a sting ray or a manta ray but i can not find any examples/pictures of it on any web site that i have been to.does anyone know a good site to go to so i can figure out what kind of bike i have so i can start restoration. thanks for any help you can provide. Did you run a query on the Picture Database here at OldRoads.com? You can view ALL musclebikes at once by doing a "Query by Style" and choosing "Muscle bikes". The Picture Database is at the top of every page under the "Technical Resources" tab. I just bought a Sears Spyder 5 and am trying to locate information that would help me determine both the year and place that it was made. Anyone know the best place to look? I'll post pics of it tomorrow. I see a lot of info in the archives here about that cycle. Use the google search box on any page here at OldRoads.com. Oldroads has an English Roadster page; that's where your Raleigh fits. There is also a Raleigh serial number chart under technical resources. James, try posting your question under the English Roadster topic here at OldRoads.com. There are Raleigh Sports experts there. Hi Everybody, I'm kind of new to the Schwinn collecting form but I think I have one of the first Sting-Rays that came out. I read that Schwinn started making Sting-Rays in 1963. I have a one that I got at a yard sale #A26184 and by looking it up it was made in Jan 1962. Did I find something special? It's 100% original and has everything but the changuard. I'm looking for a 1970-74 Huffy Red Hot 3 speed w stick shift. Hoping for mint but top dollar paid for any condition. I have a Red Hot and I am the original owner,the bike is complete and original,I am open to serious offers.I am located in pennsylvania.I will get some pictures . I have a Huffy Red Hot bike good condition, but for the 3 speed it has a shift lever. This is a hard bike to find. If you have the shifter T handle you can put it on my bike. Email me your email address and I can send you the pics of the whole bike, like 5 photos. I am looking for a 1970-72 AMF/Roadmaster Aerobee Renegade? Cannot locate one anywhere. Any idea where I can find one? original except seat & possibly pedals. Never had fenders. I can't find pics of any bikes just like it. Could it have been dealer modified? ser.# hb56166. Will appreciate any help!! Hi,Sounds like you have real beauty.Your bike was made around August 1966.It's a standard model without fenders,quilted seat and whitewall tires.The 3 speed wasnt common as the coaster brake version and very desirable today.Let's see some pics. Thanks Patrick. I'll get pics up this weekend. Thanks again for the help. I see stuff in the archives here at OldRoads about Rapidos. Use the google search box on any page. I see stuff in the archives about that cycle. I have 4 Heidemann bikes. What do you want to know about them? I don't know a whole lot but may be able to help. Email me by clicking on my name. My brother pulled this from a friends trash for me. I believe its a Schwinn Thrasher. Had the top and gooseneck pads still on it but no chainguard. I can find info on the Scrambkler but not much on the Thrasher. Head badge # 2581. rear dropouts had # GO981 on one side and # 2511C51 on the other. Guessin it was an '81 bit dont know much else on the history. Picked up at a garage sale by the serial # LB03010 stingray w/ springer fork. No tears in the seat, all chrome ( both fenders and chainguard) in place and not beat up, some surface rust under fenders. Rear reflector still hanging between sissy bar under seat. Blue in color. According to what Ive read on s# would have been made 1-2nd day of Dec 66 (last year for super deluxe?) decals are all faded or missing. Was missing back rim and tire when purchased. Trying to determin difference between deluxe and super deluxe. Bike is dismantled atm for restoration so sorry no pic at this time. any info would be greatly appreciated.